Aerosmith made an amazing comeback in the late 1980s, as the band which was essentially dead at the beginning of that decade sprang back with a second act unlike many others in rock history. However, with their first release of the 1990s, Get a Grip, the band kind of “jumped the shark” in providing manufactured, crowd-tested anthems with extra vanilla production techniques and cheap, low grade lyrics. Further, the group attempted to mask is hyper-commercialized approach by adding some boilerplate social commentary. As tacky as this approach was artistically, it certainly worked commercially as Get a Grip became Aerosmith’s best-selling studio album worldwide with sales of over 20 million copies. Produced by Bruce Fairbairn, the album employees outside composers and performers more than any other Aerosmith album, with compositions by only band members being more the exception than the rule. Joey Kramer, a quality drummer since the band’s inception with their debut album two decades earlier, is reduced to providing almost mind-numbing drumming and hardly ever adding any variation to the most basic of 4/4 beats. This may just be the most egregious of several examples where the band just decided to play it safe and not really variate from their late eighties formula, even regress at times. The album was actually rejected by Geffen in its original form during the summer of 1992 and the band returned to the studio to record more “radio-friendly” material, ultimately delaying the album’s release by about 6 months. 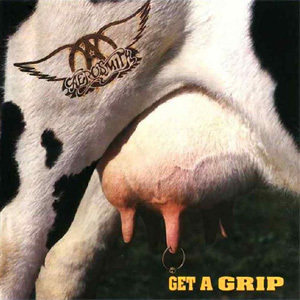 Get a Grip would be the final album Aerosmith would record for Geffen Records. The tackiness of the album is evident from the jump with the terrible “Intro” with jungle noises, behind a cheesy rap by vocalist Steven Tyler and sampling of “Walk This Way”. This leads to “Eat the Rich”, co-written by hired songwriter Jim Vallance, which starts as a decent enough, riff-driven rock song but is unfortunately tarnished by cheap and cheesy lyrics and a few tawdry lines thrown in for pure “shock value”. Then, as if to just underline the total suckiness of the song, it ends with a loud belch. Still, this song was a hit and appeared on a few future compilations. Vallance also co-wrote the title song “Get a Grip”, a frantic rap which gets repetitive. Better than the opener, but still pretty weak. “Fever” is the best of the opening trio because of strong rock and blues influences by lead guitarist Joe Perry. This still feels a bit cheap and, by this point in the album, it feels like this band of 40-somethings is trying just a bit too hard to be hip and hard rocking. Song doctor Mark Hudson’s “Livin’ On the Edge” is the first real quality song on the album, featuring Brad Whitford on acoustic guitar accompanied by almost-Eastern-sounding lead guitars and good quality melodies. There is also a decent bridge arrangement with some slight piano and the song’s only real issue is the artificially elongated ending, which reprises after a few false stops, extending the song about a minute and a half longer than it should be without much true benefit for the listener. The song was a Top 20 hit on the Pop charts. “Flesh” was co-written by long time collaborator Desmond Child and starts with a synthesized and sound-effect-drenched opening, before finally kicking with decent musical and melodic elements featuring Whitford on lead guitar. Perry’s “Walk On Down” is just as weak lyrically as other material but is a bit interesting because of Joe Perry’s vocals. “Shut Up and Dance” may be the nadir of this album. Composed by jack Blades and Tommy Shaw (then of Damn Yankees), there is a decent hook in the chorus but the verses are really cheap and repetitive. “Cryin'” was co-written by Taylor Rhodes and is, perhaps, the best song on the album. A ballad performed at maximum volume, the production value is top-notch and the song contains a great fade-out coda, reminding us that Aerosmith can really extend a song organically when they really want to. Both Perry and Whitford play guitar solos while Tyler adds a harmonica solo. Bassist Tom Hamilton adds some funky bass to the groove “Gotta Love It”, which also contains some biting guitar riffs. Child returns and adds some mandolin to the ballad “Crazy”, which has a decent enough vibe once you get past the corny intro. The song was another chart success for the band and also earned the band a Grammy Award for Best Rock Performance By A Duo Or Group With Vocal in 1994. “Line Up” features Lenny Kravitz in a fusion between Motown and heavy rock along with a bluesy slide guitar and a slight horn section. Leaving aside the experimental “Boogie Man”, the album truly completes with “Amazing” by Richard Supa. This excellent piano ballad with great chord structure and perfectly arranged instrumentation, almost single-handedly redeems the album with a great outtro similar to “What It Takes” on their previous album, but a lame 1940s-like spoken radio announcement completely rips the listener from the moody vibe and reminds him how cheesy this album really is right to the end. Although a commercial phenom, Get a Grip tainted Aerosmith’s reputation for authentic rock quite substantially. They would redeem themselves a bit with their next album, the fine Nine Lives in 1997, which was much more substantial musically but less successful commercially. Interesting review of the songs I wrote for Aerosmith. Just like many bands and artists these days, Aerosmith also used a ghost songwriter. The “Jungle” sounds were inspired by one of my favorite but stupid ELO songs “Jungle”. I did sometimes used many pen names (including Alexander Nevermind, Don Von Tress, Desmond Child and Max Martin) or let the artist take credit. The idea to write the song Eat the Rich came from Krokus when they released their 1983 album Headhunter with the song “Eat the Rich” and saw them in concert with Def Leppard. To commemorate that date…I borrowed their song title. An interesting fact about “Living on the Edge” and “Nine Lives” is that the song titles came from lyrics of “Black Cat” which I wrote for Janet Jackson.